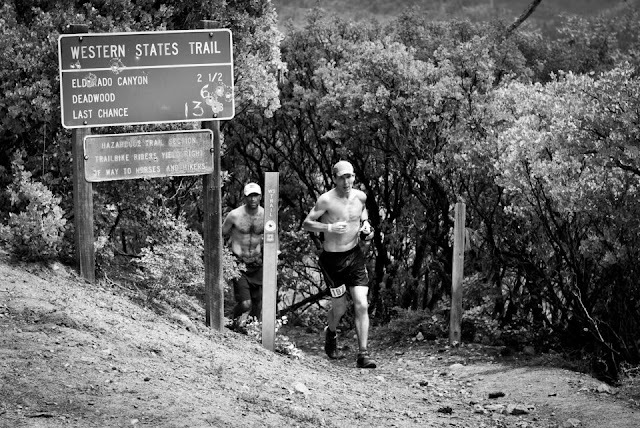 Looking back on Western States I feel a great relief it is over. The whole event is such a production. I mean that in the most positive terms, but damn if Western isn’t so consuming that it forces almost everything out of one’s psyche, especially as the weeks click by closer to race day. The sacrifice. The focus. The energy it consumes. (If you let it.) It is just so intense. It takes living and being to a whole new level. Ironically, that is exactly what I love about preparing for an event like Western. Still, it is important sometimes to step back from things I love, pause, and absorb the journey. Leading up to Western I felt unusually calm and confident in my mission. A low 16 hour time, whatever the weather, whatever the route, is what I was after and what I figured realistic. It wasn’t like I came up with this time the week of either. I decided last December this is the time I was after. A top 10 was in the back of my mind and I figured the closer I came to my goal the more likely I would finish amongst the top 10. Low and behold, I finished in 16:18 and 10th place. Friday night before the race I was in bed by 9:15 and fell asleep in only a few minutes. This never, ever happens the night before a big race. Falling asleep instantly the night before Western States? It was a miracle. Even better, I slept like a baby the whole night through and awoke at 3:00 perfectly rested, springy and for a minute or two completely unaware that it was even race day. Perhaps this was a good omen. Even as I prepared that morning and made my way through the crowd to the race start I never felt nervous or anxious. The experience was a bit surreal; it felt like a normal day, like going to work. Even before big solo runs I usually get nerves- just the idea of what is about to happen or what could happen fires me up. Thinking back as to why the night before and morning of Western I felt so calm I still don’t have definitive answers. The likely cause is I simply knew and believed, in my core, I was prepared and that I didn’t have to remind myself I was prepared or that I should ‘rely on my training’. I wasn't worried about the other runners and I didn't care who was there. I needed only to go out and do what I came to do. That was it. For the most part, the race unfolded exactly how I figured it would, for me and for a few others around me at least. Though in honesty I was surprised there wasn’t more carnage amongst the front crowd. That I will chalk up to the weather and the incomprehensible depth of talented and prepared athletes who came to demonstrate their skill in California’s famed, rugged Sierras. My hat is off to everyone who delievered on race day- the athletes, the volunteers, I mean everyone- and especially to those who perhaps discovered a new low gear they didn't realize they had before and cranked it. Timmy’s run? Holy hell. He is my new hero. Ellie? WTF! She is superhuman. They both, in my estimation, are a lock for UROY and PYOY. (Apart from Bryon Powell, of course.) That’s right, and all in a day’s work. That is, unless a certain young man runs under 23:23 at Hardrock. Will that happen? It would certainly make things interesting, wouldn't it? Could it happen? Absolutely. Eventually, Dakota, or Kilian, or Timmy, or some other pimp will run sub 23 at Hardrock. Most likely sub 22:30. It might take perfect conditions to do it, like at Western, but it will eventually happen. It is only a matter of time. Back to Western, my only regret is that my legs didn’t quite hold up the same after the back-to-back descents from Last Chance and Devil’s Thumb. Zeke and I ran together for several miles leading up to that point, with Yassine yo-yoing off the front. Unfortunately, I was the one who set the pace down both of these descents, as well as the climb up to Michigan Bluff (Zeke set the pace up Devil’s) and I can’t say the two descents didn’t extract a bit of pep from my legs. By the time I reached Rucky Chucky and the River I was in 10th place and unsure how close or how far back Yassine, who I passed some time after Forrest Hill, Olive Oil Joe or some other runner(s) were in proximity. I climbed the road well enough from the River to Green Gate, stopping once to pee and power hike a few short sections. I heard cheering at the River crossing only monents after I left, signaling the arrival of a trailing runner, and it was then, I knew, that the race for Top 10 officially took hold. I picked up Paul as a pacer at Green Gate, and Gaby and Pattie once again helped process me through the aid station efficiently. Moments after leaving Green Gate Paul and I ran by a walking Mike Wolfe. I wasn't sure if Mike would DNF but it looked like he might. Runners always DNF at Green Gate, it seems. (Turns out Mike did finish, and finish well, but mostly likely after a fair bit of suffering.) The climbing continued after Green Gate. Despite my sore quads I was climbing well enough and I figured if it was Yassine who I heard the crowd cheering for shortly after I crossed the River I felt good about my chances of gapping him the more we had to climb. The only problem was, it wasn't Yassine. Running in ninth place I felt slightly less pressured but it didn't hold me back from moving along at a pace my sore legs would allow. Just before Auburn Lake Trails mother nature called and I was forced to pull over for a few minutes. I wasn't happy to stop but I was happy for the relief. Suckingly, before I hopped back onto the trail Olive Oil Joe- who was actually on my tail at the River- and his pacer ran by. Joe looked sore and banged up but it didn't stop him from moving strong and staying focused. 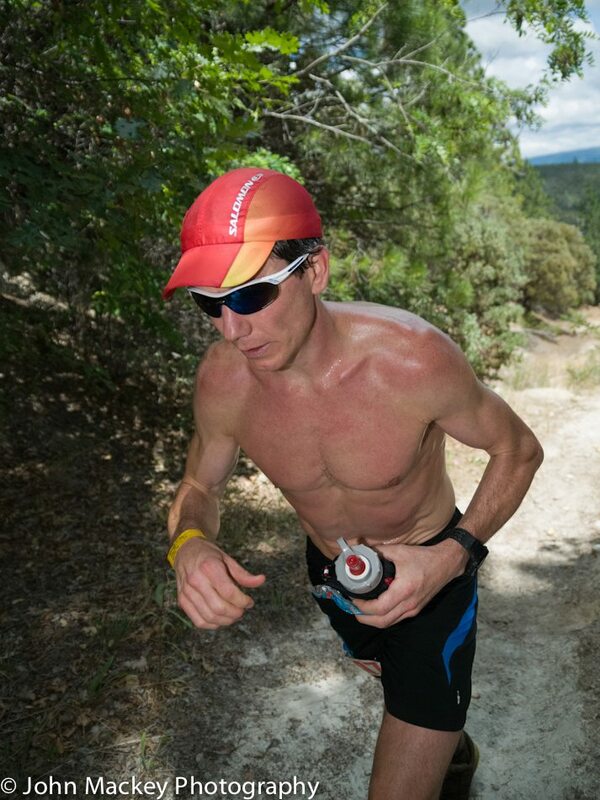 In fact, it most likely motivated him to run harder and finish faster so he would have to suffer less. That, plus I am sure he was hell bent on a top 10. Me, I was now back in 10th. Back to feeling pressured. Paul and I kept moving. I ran pretty much every hill all the way to the finish, only stopping to hike for a few seconds here and there, including the climbs up to Highway 49 and Robie Point. 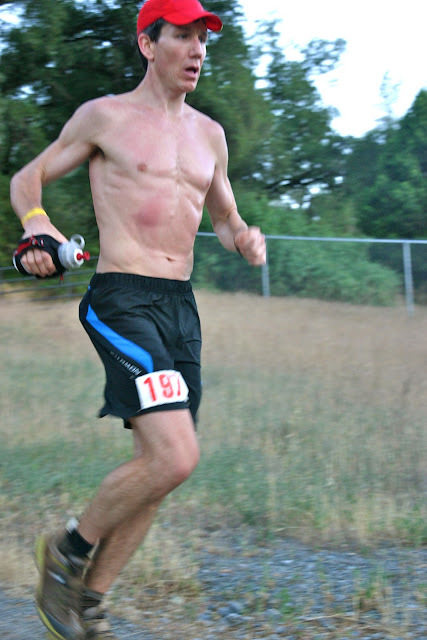 Paul unfortunately fell slightly behind on the climb up Robie and I eventually picked up AJW and then also Gaby on the road leading to the track at Placer High. We ran together, laughing as the last bit of pale sky turned dark, and I was thrilled that- for me- the race was all but over and a return ticket to Squaw next summer would soon be stamped. Finally, I entered the track and crossed the finish line after several high fives. Needless to say, it felt good to be done. And I was so glad not to have suffered more race drama after being passed by Joe in the mid 80s. I can't imagine how hugely annoying and stressful it would have been to fight for M10 over the final few miles. But I would have done it. No question. I'll definitely return to Western next year. How could I turn down the opportunity to sport M10 and go after another such life opportunity? The sacrifice. The focus. The energy it will consume will make life all the better. Fortunately though, for now, Western is over for another year. It is time to relax. But just for a bit. Soon many new prize experiences will arrive to focus on and embrace. Namely, in September I’ll be a Dad. Yes, indeed. I’ll be a new parent and father to a baby boy. I am very excited, and I am very nervous. Plus, in a few weeks Gaby and I move into our new home in Charlottesville; a gravel road leads to trails on O-hill and the Rivanna Trail from the tail end of our new street. And now through mid July I wake each morning with the sun, look east over the Rocky Mountains from my patio in Vail, and chomp at the UTMB bit. Life is good. Running away from Robinson Flat. Yassine in tow. Photo by George Thoma. Entering Michigan Bluff. Zeke makes his break after the aid station. Photo by Brett Rivers. The climb to Bath Road. Photo by John Mackey. Highway 49. Gaby said "two runners are only a few minutes behind you!" That was all I needed to hear (whether it was true or not). Photo by Meghan Hicks. Congrats on a great race (I was cheering you on through the computer) and major congrats on what's coming in Septempber! I've got a Aug/Sept edition coming as well. We'll have the next generation of ultrarunners to raise-up here soon. If the lottery gods favor me, maybe we can trade parenting stories next year in Squaw. Neal- we were sure cheering for you here and were very happy to see your top 10 finish. Nice work. And congrats to you and Gaby on the bouncing baby boy. I enjoy your recaps, Neal. Your fight to the finish, and humble attitude once you cross the line, is always inspiring. Great run, and congrats on future parenthood! Thank you to everyone for the thoughtful comments, both on this blog and in emails, texts and phone calls. I love hearing feedback from those I respect and look up to in the running community. Mike- not sure what the heck happened to your comment above. Dan Rose left a heartfelt and funny comment but it seems to have disappeared completely, which is totally random. David- Yes, I was the guy dressed like you during the race. ; ) Nice work out there yourself. 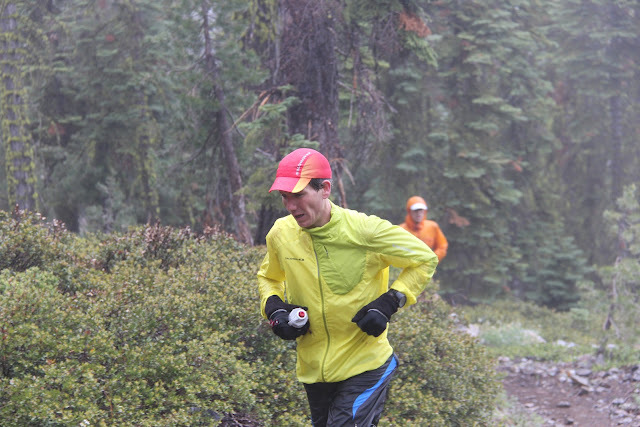 See you at UROC, for sure, but I'll be spectating.